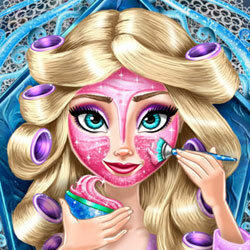 Description: Get into the Ice Queen's castle and discover her real makeover session, the she has a very special spa treatment. When she decided to isolate herself in the ice kingdom she didn't think about how the cold can hurt her skin. Now you need to solve her skin problems using sparkly masks and then have fun with all sorts of makeup and dress up combinations. Choose an awesome face tattoo, a beautiful dress fit for a queen and give her the most awesome ice power ever. At the end of the real makeover she has to be ready to rule the kingdom of Ice!